After a very successful 2018 where 40 youngsters attended yds events, it is more of the same for 2019! Following some feedback I have tried to do some Saturdays and some Sundays and the now annual training weekend. Venues will be confirmed nearer the time. I will put out info re venue, times etc and take bookings when sorted. With ongoing support from the ACU Western and our sponsors we hope to keep costs to the same as 2018 for the majority of training days. More sponsors are always appreciated. Watch this space for info on the 1st training day of 2019. "Harold Cleaver, Sonny to all his friends sadly passed away on Monday 10th December at the age of 89 after a lifetime love affair with all things motocycling. Sonny was a long time Stroud Valley Member who competed in Scrambles in the 1950s and early 60s. He was a tireless worker a staunch supporter at the 3 scrambles the club ran every year. He could be found running the start, a job he usually did with John Ballinger. My first recollection of Sonny was at Nympsfield where I asked for another roll of Chestnut paling around the start and this chap appeared over the top of hill with a roll on his shoulder having carried it from the bottom. That was Sonny. (most people struggled to lift one). Living in Tetbury he was a skilled Cotswold roof tiler, a dying art, and his skills were always needed keeping him busy all the time. As the scrambles side of the club declined Sonny started to join the informal, mostly trials, gatherings in Bisley where he found many new friends and became a popular member of "Team Stirrup Cup" going on regular trips to the TT and coming for a few years on the spring trip to the sun in the Canary Islands. With the start of the Pre 65 movement He found a new outlet for his energies and was able to indulge his lifelong love motorbikes until quite recently. When I visited him a couple of weeks ago he was bemoaning the fact he could no longer kick-start his Gold Star. Lifelong trials rider and supporter of trials events Simon Wynne has passed away at the age of 59. As well as competing regularly aboard a wide variety of machines including a Beta Alp, an immaculate Yamaha TY, and pre-65 bikes, he could be relied on to observe and help out at events, and gave his time to the sport willingly. Ledbury MCC has had to report the sad news that Frank Yates has died. The Biggest threat to UK Bikesport. It's Scottish Number 12... for Craig and, slightly better, win number 12 for Dougie. So success for our locals at the Six Day. You've probably all seen the full results but 2 first class awards and a second will be landing on the mantelpieces of Craig, Gareth and Vee. And here is day one of the Video Log from one of our website sponsors and 82nd placed rider Craig Talbot. And more days: day 2, day 3, day 4, day 5, day 6. Took place after the final YDS training session organised by Simon Welch plus a great supporting crew and a New female Coach. The presentation of centre awards had unavoidably been pulled forward by one week to 9th December at Woolaston. The Netherend Inn was full to near bursting. 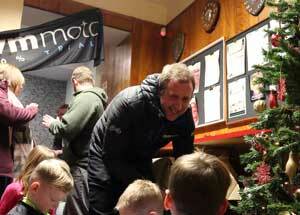 Chair of the Trials Committee Tony Falconer presented the awards from the Main and Clubman Championships followed by the Year's YDS awards presented by BVM's Craig Talbot, and in true Xmas spirit played Plain Clothes Santa with Goodie bags for all the youth contenders. The late Brian Valder's daughter Amanda brings us sad news that Brian's wife Bridget passed away 5th Dec. Her funeral will take place on Wednesday 20th December at Gloucester Crematorium, Coney Hill Road, GL4 4PA at 2.30 pm. The family ask for there to be no flowers but donations to the same two organisations, The British Heart Foundation and the ACU Benevolent Fund. If there is anyone else that you think should be notified please could you forward this message on. If you could give Amanda a rough idea on attendees for catering please, that would be appreciated. Most of you will already know we lost Brian Valder in May 2017. A most valued member of our sporting community. As an observer in the majority of our trials for a long time we will all have met him and benefited from the time and care he put into our sport. Read the obituary Ben Falconer compiled and see some great action shots from his past. Purchased new in 1963 by the late John Husband. 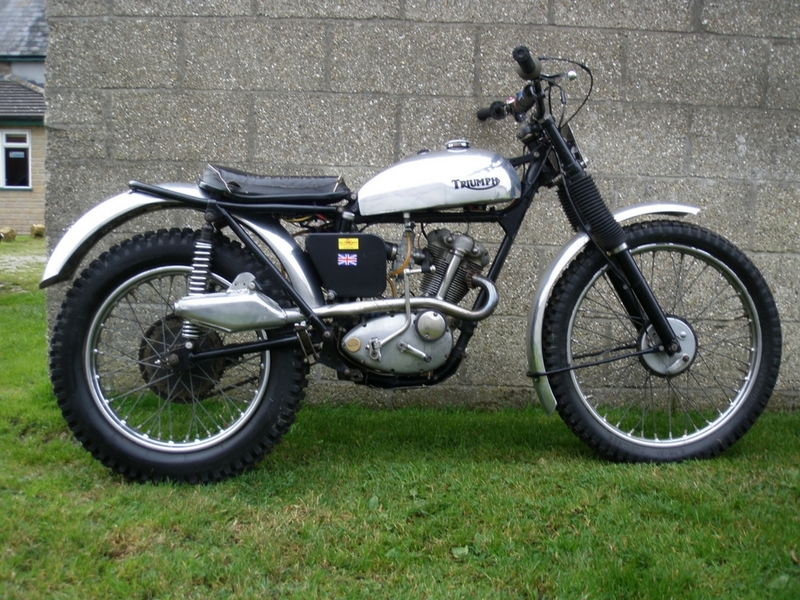 Ridden in 1964 Wye Valley Trial by Jon Bliss to win the Western Centre Championship. Numerous trial success over the years. This is a rare and original ex works trials bearing matching frame and engine numbers. Still has original high tensile Dunlop rims, original Energy Transfer Ignition Alpha big end fitted and Italian piston which need full engine temperature to eliminate exhaust smoke. I would be most interested to hear any history/information on the bike (registration number EAD 248A which may or may not have been with the bike from new) and even have a photograph of it in action if such exists that I can see and keep with the records." Would any of our readers have, or know of, any photos of the late Geoff Gibbons who was a rider and supporter of events in the centre? 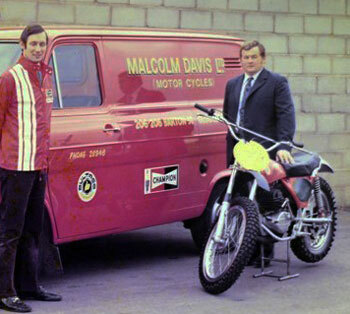 His son, Bill, spotted this one on our site where he was handing over the keys to a Ford Transit to Malcolm Davis.